It is rare that I go out for lunch, typically opting to bring my own (or scrounge an affectionately called “Workiva Special” from the complimentary office snacks) since it’s much cheaper and much easier to make healthy choices. However, on the days I am not on top of life and don’t want to eat yet another quesadilla, my favorite quick, inexpensive, and reasonably healthy spot is a local Brazilian BBQ place. Since you pick your base, your toppings, and your sauce, it’s easy to customize and they offer lots of vegetables. (Plus they have sweet potatoes, which is a sure way to win me over.) My go-to order is brown rice with greens, roasted root vegetables, black beans, steamed collard greens, and their mango BBQ sauce: delicious, filling, and a hefty serving of vegetables all in one. Since all of these components are pretty simple to make, craft night with friends seemed like a great chance to try my own version. 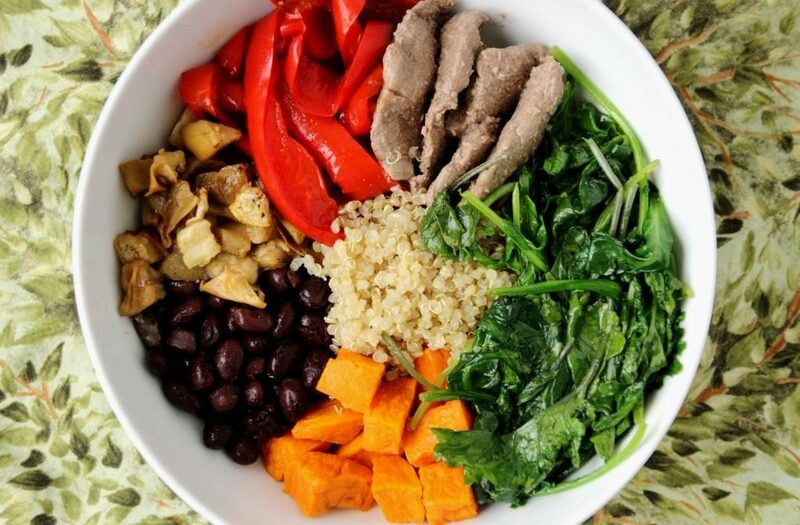 Although it requires a fair amount of prep work and oven time, it’s definitely not complicated and allows all your guests to adjust their bowls to their own preferences. If you use vegetable broth or water to cook the quinoa, your vegetarian and vegan friends can easily join in. And if there are any leftovers, everything reheats great. For the roasted vegetables I chose sweet potatoes, bell peppers, and eggplant, but you can obviously pick whichever ones you want. Just make sure to adjust your baking times accordingly, as everything can take somewhat different times to reach their optimal texture. Potatoes take the longest, followed by things like broccoli or Brussels sprouts, and peppers or summer squash take the least. Keep an eye on things in the oven and you’re good to go. Stir-fried steak is easy and doesn’t take any extra oven space, but shredded (or diced) pork or chicken are also great options. Not a meat-eater? 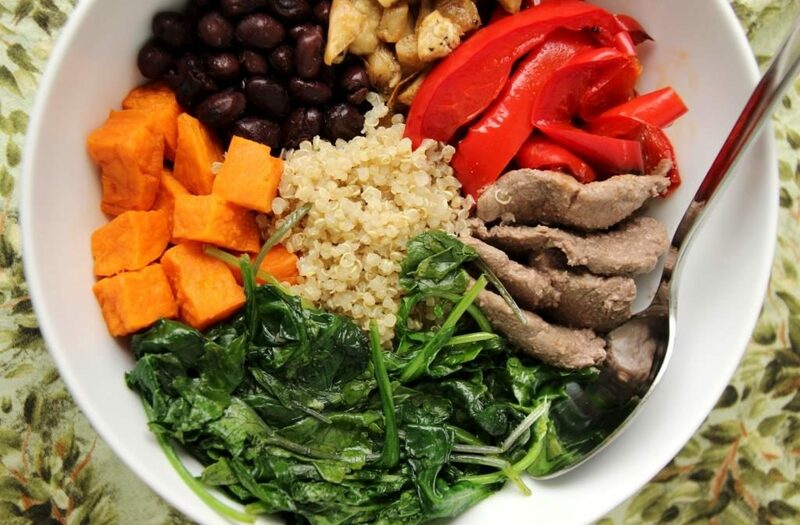 Just skip this step entirely, the bowls are delicious without any animals in them too. I tend to eat quinoa in lieu of rice, but any similar grain will work great. I like to cook my quinoa in broth to give it a bit more flavor, but if you don’t have any around just use water as normal. Spinach goes with everything so I sautéed some here, and also added some black beans because why not. Now, let’s talk about some sauce. As a huge fan of barbecue sauce in general, the mango version at Five on Black is a fun twist on a classic. 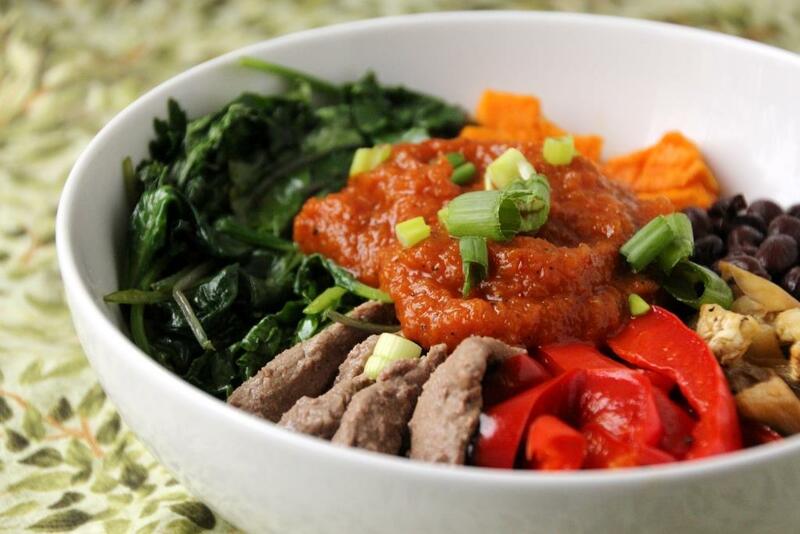 I slightly adapted a recipe with a similar profile and it really takes these bowls up a notch. 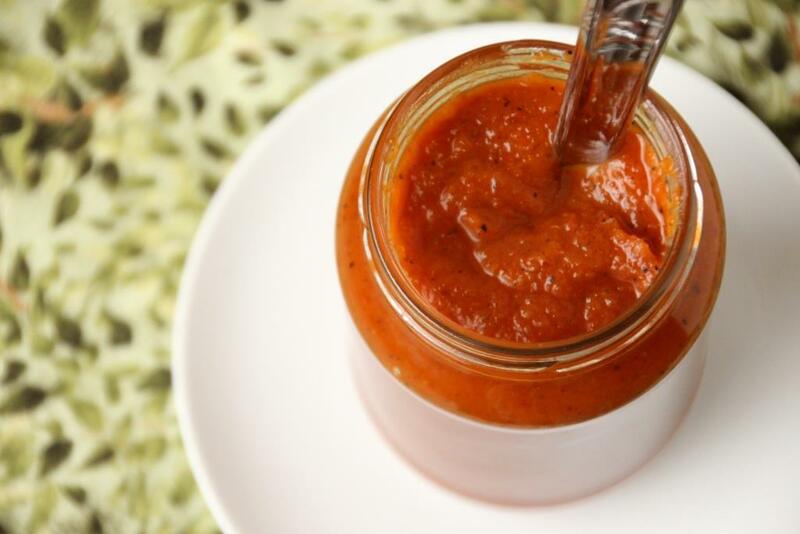 Obviously you can substitute your favorite homemade or store-bought sauce, but if you have the time I hope you give this one a shot. 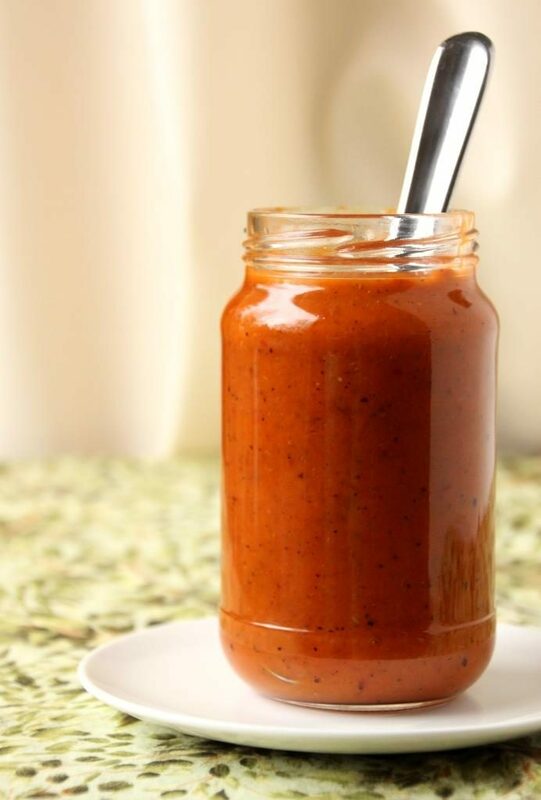 Lightly sweetened with maple syrup, a vaguely tropical flavor profile from the mango, and a little kick of chipotle, this sauce hits all the right taste buds in all the right places. 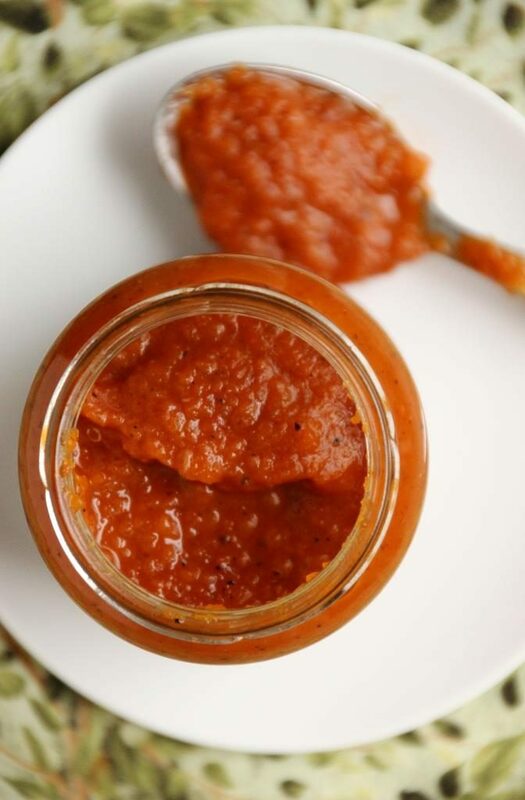 Definitely use a very ripe mango for the best flavor, and adjust the syrup and adobo sauce amounts in order to lean sweeter or spicier. I’m pretty wussy about spice so I didn’t add any extra, but if you like a spicy experience you could easily double or triple the adobo sauce, or even add an extra chipotle pepper. Tons of veggies, good sources of protein, and a magnificent sauce come together in a wonderful and healthy meal, perfect for all weather. Give my version a try or create your own, but be sure to let me know what you come up with! Preheat oven to 425 degrees Fahrenheit, adjusting shelves to fit two pans. Line two baking sheets with aluminum foil. In a large bowl, mix sweet potatoes and 1 Tbsp olive oil until well coated. Spread in one layer on one of the prepared baking sheets. In the same bowl, mix eggplant and 1/2 Tbsp olive until well coated. Spread in one layer on half of the other baking sheet. In the same bowl, mix eggplant and 1/2 Tbsp olive until well coated. Spread on the other half of the baking sheet. Place sweet potatoes on the top rack and roast for about 40 minutes, until softened and lightly browned. After about 20 minutes, place eggplant and peppers in the oven and roast for about 20 minutes, until peppers are starting to blacken and eggplant is nicely browned. Meanwhile, cook quinoa in broth or water according to package directions. When the vegetables are almost done, heat 1 Tbsp olive oil over medium-high in a large wok or frying pan. Wipe out extra meat juice from the wok, and heat another tablespoon of olive oil. Add spinach/kale and sauté until wilted and heated through. 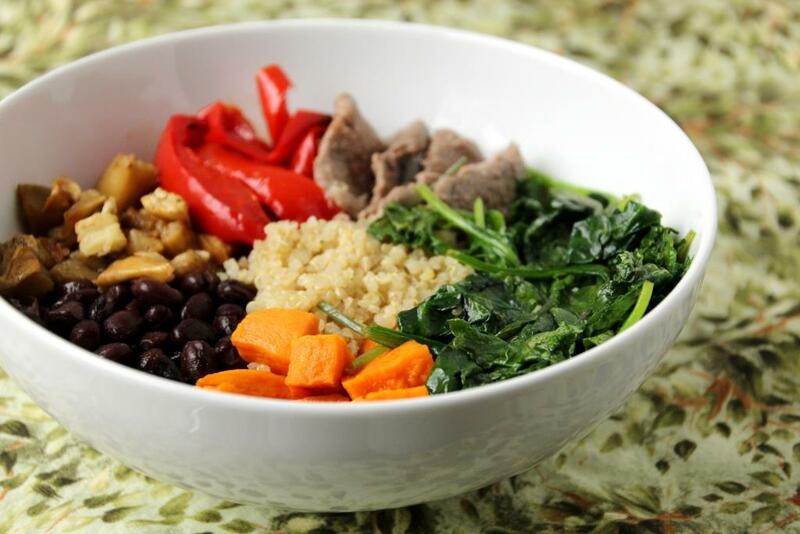 For each bowl, start with quinoa, and arrange veggies, beans, steak, and greens on top. Drizzle with mango BBQ sauce, and optionally top with green onion. Enjoy hot and refrigerate any leftovers in separate containers, for easy build-your-own dinners and lunches. 1 For a vegetarian or vegan meal, skip the meat and use water or vegetable broth to cook the quinoa. Reduce heat to medium low, cover with a lid, and simmer for at least 30 minutes, stirring occasionally. Remove from heat and puree completely using an immersion blender1. If desired, stir in additional syrup or adobo sauce to suit your preferences. 1 If you don’t have an immersion blender, you can use a regular one or a food processor, but let the sauce cool for about 10 minutes first. 2 This recipe is vegan if you choose a vegan Worcestershire sauce.